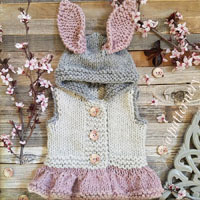 Go to original pattern for design DROPS Extra 0-1357. Set consists of: Knitted hat, neck warmer and wrist warmers in garter stitch edge in 5 strands DROPS Air. 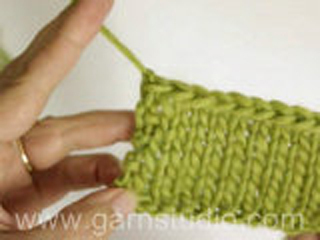 DROPS STRAIGHT NEEDLES SIZE 20 mm - or size needed to get 5.5 sts x 7 rows in stocking st with 5 strands = 10 x 10 cm. DROPS CIRCULAR NEEDLE (60 cm) SIZE 20 mm - or size needed to get 5.5 sts x 7 rows in stocking st with 5 strands = 10 x 10 cm. NOTE: Entire set = 250 g Air for both sizes. 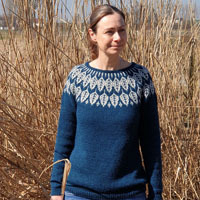 You can get the yarn to make this pattern from	23.00£. Read more. NOTE: Make sure not to cast off too tight. Cast-off edge must be just as elastic as cast-on edge. 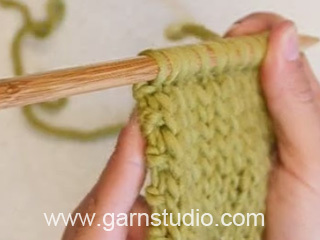 A tip to achieve this on thick needles is to work stitches as far in on needle as possible to give a little extra yarn for every stitch. Cast on 27-28 sts with 5 strands Air on needle size 20 mm. Turn and work as follows (1st row = RS): 2 sts in GARTER ST (= edge st), stocking st over the next 23-24 sts, 2 sts in garter st (= edge st). Continue back and forth like this until piece measures 17-19 cm. REMEMBER THE KNITTING TENSION Now insert 5 markers in the piece without working. Beg from RS and insert 1st marker after the first 2 edge sts in garter st, 2nd marker after 5-5 sts, 3rd marker after 4-5 sts, 4th marker after 5-5 sts, 5th marker after 4-5 sts, 7-6 sts remain after last marker. Now dec 1 st before every marker - SEE DECREASE TIP. Dec every other row 2 times in total = 17-18 sts. 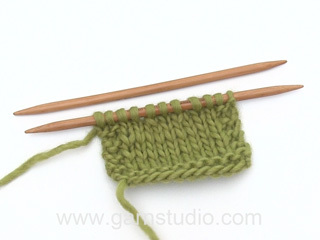 On next row from RS work as follows: Knit 1-2, then knit the rest of the sts tog 2 by 2 = 9-10 sts. Cut the yarn - keep some yarn for assembly. Pull yarn through the remaining sts, tighten tog and fasten. Then sew seam downwards with 2 strands Air as follows: Sew one and one st tog in outer loop of outermost st in each side, to avoid a thick seam. Fasten the strand. 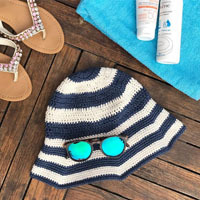 The hat measures approx. 24-26 cm vertically. Cast on 33-35 sts with 5 strands Air on circular needle size 20 mm. Turn and work as follows (1st row = RS): Work in stocking st with 2 edge sts in GARTER ST - see explanation above - in each side. REMEMBER THE KNITTING TENSION When piece measures approx.. 21-23 cm (adjust so that last row is from RS), cast off with K from WS - READ CAST-OFF TIP. Sew neck warmer tog by sewing one and one st tog in outer loop of outermost st in each side, to avoid a thick seam. Fasten off. Cast on 9 sts with 5 strands Air on needle size 20 mm. Turn piece (1st row = RS): Work in stocking st with 1 edge st in GARTER ST - see explanation above - in each side. REMEMBER THE KNITTING TENSION When piece measures approx.. 12 cm (adjust so that last row is from RS), cast off with K from WS - READ CAST-OFF TIP. 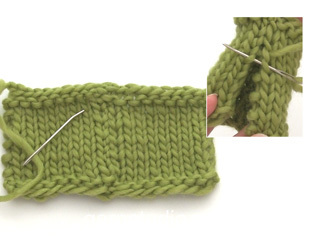 Sew wrist warmer tog by sewing one and one st tog in outer loop of outermost st in each side, to avoid a thick seam. Fasten off. Knit another wrist warmer. In hat description: "Beg from RS and insert 1st marker after the first 2 edge sts in garter st, 2nd marker after 5-5 sts, 3rd marker after 4-5 sts, 4th marker after 5-5 sts, 5th marker after 4-5 sts, 7-6 sts remain after last marker. Now dec 1 st before every marker. Dec every other row 2 times in total" But before 1st marker there are only 2 edge sts! Dear Pumpkin, at the first decrease k2tog the 2 stitches before the marker (the first two stitches), and then the stitch before the marker, and the one right after it (the first 2 stitches again). I hope this helps. Happy knitting!